Udah saya tengokin tadi he.he...he. I would also like to know if it is possible to change the text that appears "we laugh, we cry ..." for another text. Emm... I download the template in your link but I can't open the archive. 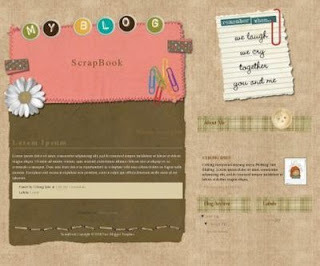 cantik blogger template nu kan????????????????????? Essa versão é só uma demonstração? Porque no meu blog depois de um dia o template estava desconfigurado e com a informação de que o meu limite havia sido excedido.Por favor me ajudem, eu realmente AMEI esse template.Eu agradeço. hello, I really love this template. I've tried to download this template into my blog. However, when I click at download, it says that it has been blocked..... How can I get this template? hi! I've download it but when i unzip it using winRAR, an error occur. Can you please email the code to me to my mail please...Thank you..
pas mau di download, ktnya this website has been reported as an attack site. how can i get this templete... i just tried it so many times but fail to download since it use win.rar... could u pls give me the code? really thx for your corperation..
gimana caranya makai template ini..! kasih tahu HTML nya please..!! please,kasih tahu aku kode HTML nya..
uda q upload k blogku tapi nggak bisa..
@hasni: sudah di coba download via link download nya? eh,uda bisa q upload nih..! cra extract tuh gmn y ? duh .. sori , ga ngerti bgtu"an . klw ga , knp ga lgsg html codeny aj ? ada file gambarnya, jd harus dalam bentuk rar..
Makasih, sekarang saya pake template ini sekali pasang sukses tanpa kesulitan. hi..i m using this template now..
how i can put this template in my blog! ?, i love it!, is so nice!, but i don't know how installing in my blog! ; plzz, somebody help me! Hi, I too am having trouble with the 2nd and 3rd columns showing up down at the very bottom. Is there a fix for this? Please view my blog, or email me to let me know how to fix it. I love this template! Hi, I like this template very very much but preferabble with the side bar from top instead of having it @ the very bottom righthand side, who can help me ?? This is cute.Anytime I search for templates I always download here.I dont know why if i get it from here it works but if i get it from other place(except the background only codes) I cant. hello. i need help. can someone please tell me the steps how to use this template ? hey but where's the nav bar go? how can i edit the font, the font size and the font color ? heii ,, i'm again ..
kok gabisa dipake yaa templatenya? bagaimana cara menerapkan template ini ? mohon bantuannya..
bagaimana cara penerapan template ya? q udh dowload tp file ya dlm bentuk xml document. this template is so awesome, I have been want it since I have a blog. But,I can't use it for my blog template. When I upload this template certainly that XML wrong. Why this? Thanks.